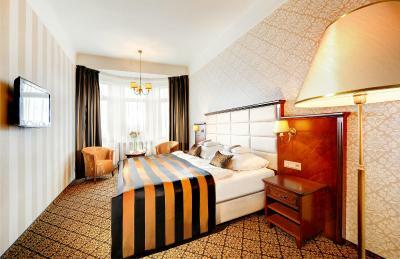 Lock in a great price for Grand Hotel Praha – rated 9 by recent guests! 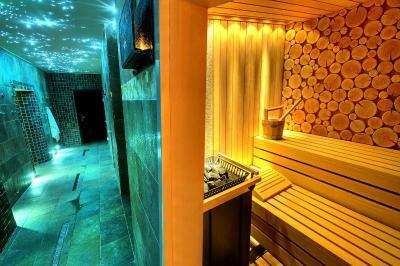 Wellness spa, comfy bed, location, and breakfast. We had an amazing stay. Staff was very polite and helpful. Rooms are spacious and clean. Nice view. 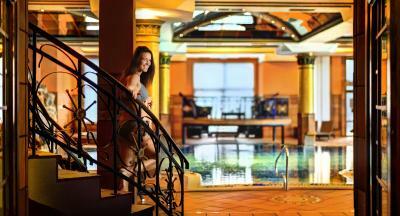 Great outdoor heated pool and spa facilities. Delicious breakfast! Amazing location,hotel staff is so friendly,nice and super clean room,great wellness... Looking forward to book that hotel again.I ve been there 4 times already and so satisfied! Hotel is located in amazing location offering not only great views but at the same time various activities in the nearby area. Kitchen offers variety of food options of high quality. 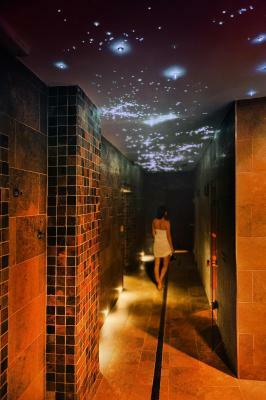 Wellness and SPA for sure is above and beyond giving great time for relaxation. This hotel has a lot of character--a classy, historic mountain hotel. The rooms were clean, well-appointed, and the breakfast was incredible (lots of options, including cooked-to-order items). It also is near a lot of hiking options and the gondolas to Tatranaska Lomnica. The price was very reasonable, given the services offered. very good location with beautiful views to the mountains. After hiking every day we enjoyed the outside thermal spa that helped to relax the all mussels. The breakfast is very good. 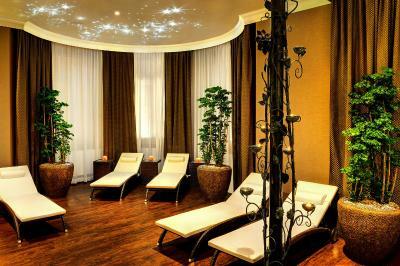 The spa facilities are exceptional. The breakfast is very good. Location was in the mountains. Quiet and gorgeous place. 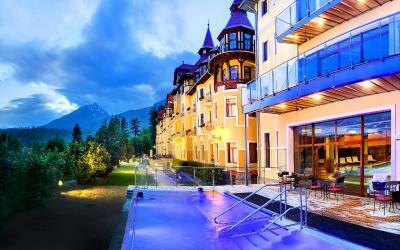 Grandhotel Praha is located Tatranska Lomnica, at the foot of Lomnicky Peak, right in the heart of High Tatras and only 2,950 feet from the nearest ski elevator. 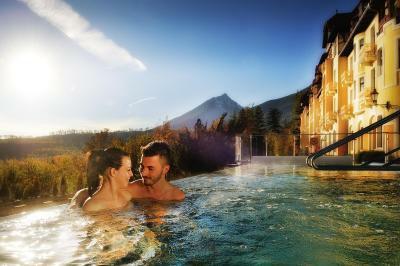 The hotel provides spa and wellness facilities for free as well as an unique outdoor infinity heated pool offering views to the valley and High Tatras Mountains. 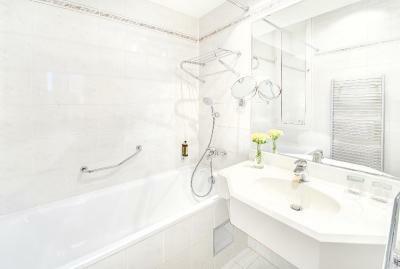 Each room at Grandhotel Praha comes with a TV with satellite channels, a mini-bar, a telephone, a safety deposit box and a private bathroom with a hairdryer, free toiletries, a shower or a bath tub. Some rooms also feature a balcony. 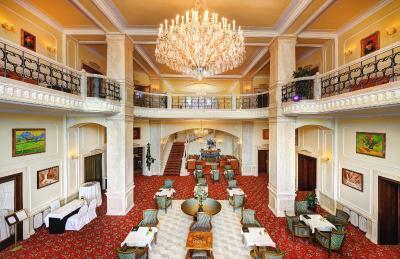 Hotels history dates back to more than 100 years ago, to its spectacular opening in 1905. 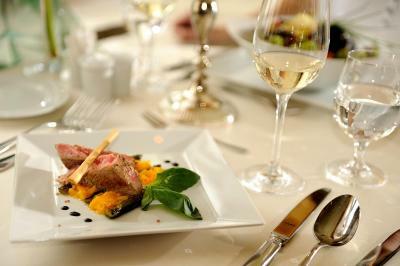 It offers rich history, stylish interior and an excellent cuisine. 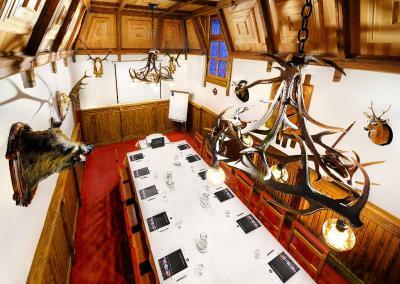 Meals can be also enjoyed in the traditional Slovak style restaurant reachable within 350 feet. The nearest bus and train station are set within a 15-minute walk and the center of Tatranska Lomnica is reachable within a 5-minute walk. Hotel ski busses to the nearest ski elevator are offered for free and the Poprad Airport can be reached within a 20-minute drive. 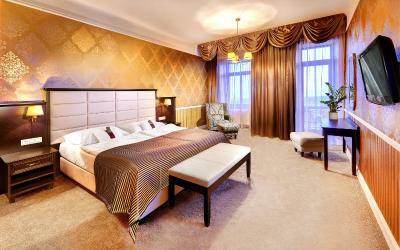 This is our guests' favorite part of Tatranská Lomnica, according to independent reviews. 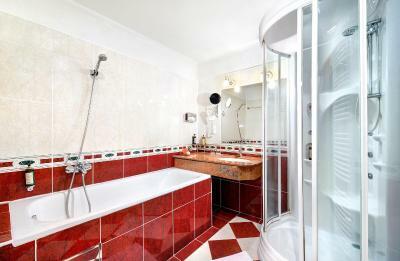 This room features a mini-bar, cable TV and a bathroom. Please note that guests sleeping in extra beds are charged separately for the dinner. 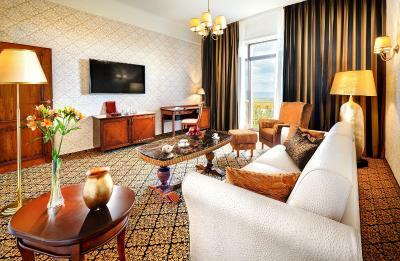 These spacious suites come with a bedroom with a double bed and a living-room. 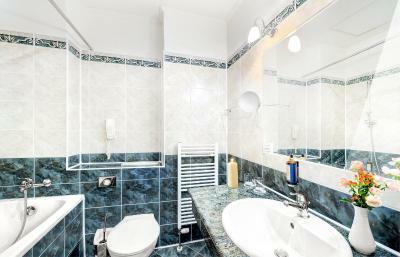 It also consists of a mini-bar, a safety deposit box, a telephone, free WiFi, a TV with cable channels and a bathroom with a shower or a bath and free toiletries. Some units feature a balcony. Please note that if booking for 3 people, the third person sleeps on the extra bed. 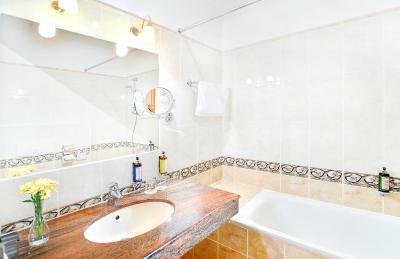 Please note that the suites are furnished in various designs and the exact suite type can not be guaranteed. Reconstructed in 2016, this room comes with Secession style furnishings, a bedroom with double or twin beds and a private bathroom with a bath or a shower. Some rooms also feature a balcony. Please note that 1 or 2 extra beds are available in this room type. 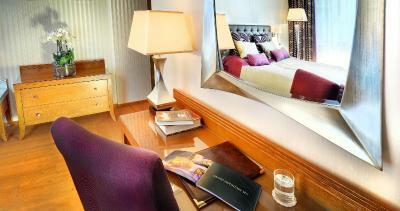 These new rooms feature modern furnishings, a TV with cable channels, a mini-bar, free WiFi and a safety deposit box. 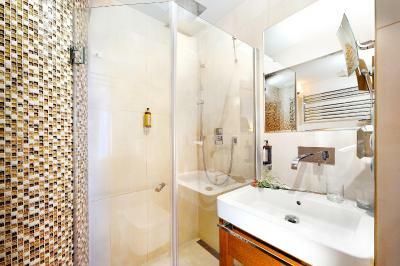 The private bathroom is provided with free toiletries, as well as with bathrobes and slippers. 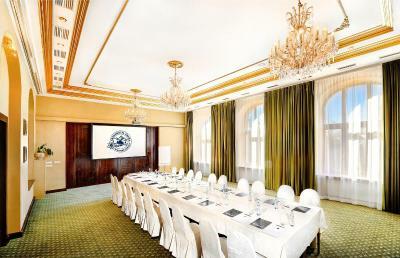 Grandhotel Praha has been writing its glamorous history since 1905. 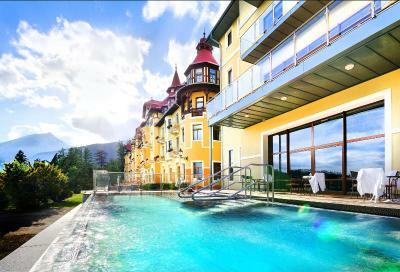 It was built in beautiful Art Nouveau style, which takes you back in time to the era of a real fairytale in the Tatras. Please note that room rates on the 24 December include a Christmas Eve dinner and on the 31 December include a New Years´s Eve gala dinner. The hotel was OK, just wondering about the worth for money. Was expecting something better for the money, especially during an off-season. Everything was perfect. The rooms are great, breakfast was amazing. The view is fantastic. Pool is breathtaking. Our room could have been cleaner. The carpit was dirty. The hotel is located in a beautiful place. The building is very nice indoor and outdoor as well. There ara many restaurants arund, where traditional slovakian food can be found. The ski lifts only a few minutes away. There is a train station near to the hotel, taht goes to Csorba-tó which is a must see place. 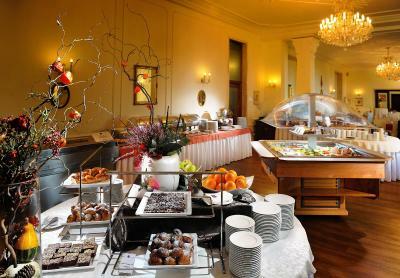 The breakfast has a wide variety of food, very tasty. We loved this hotel and all of the facilities. The staff were very friendly and helpful. The kids’ corner / play area is rather basic, poorly equipped, majority of toys broken and malfunctional. The hotel management could pay more attention to this area and thiscreally was the only major drawback during our stay. Coffees (espresso based) served during our stay were constantly unpalatable - but there are many options to drink a nice cup of coffee within walking distance from the hotel. We spent 2 nights at this beautiful hotel ;-) Big, nice and percetly located hotel. Nice historical building. Good service from the whole staff - always helpful, attentive and friendly. 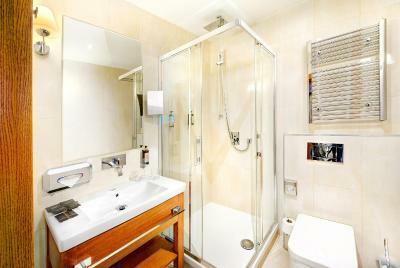 Spacious rooms with big and comfortable beds, well equipped bathroom. Percetly clean Delicious food for breakfast, all fresh ;-) Perfect spa & wellness with pool and relaxation area with stunning views of Tatranska Lomnica. Not cheap but amazing experience ;-) we will come back! The rooms were a bit cold because the central heating system was off for many hours during day and night. I had the same experience in this hotel before so I know it wasn't caused by breaking down. That's what they do. They just turn it off and you can't warm up your room as you wish. The windows don't close properly so you can feel wind coming inside. Breakfast was excellent with good variety. Close to the ski slopes. Comfortable beds. Swimming pool was good. We have dietary restrictions (gluten free) and had a pet with us and hotel staff went above and beyond to make sure we had everything we needed. Unfortuneately there are way more thing we did not like then what we liked. The price of the suite is twice as the normal room, you expect some view, but all you can see is the car parking, the walls are thin, you can hear EVERYTHING, impossible to sleep in the morning, weird smell came from the shower in the suite. The cleaning lady did not wash our glasses/ gave us new one, left the trash on the table. The staff does not speak good english or german, wich is ok but they say okay okay to everything and you think ohh okay he understands me, but no. For example: we called room service for drinks to our suite, waited 1,5 hour, then went down to the bar ask about it: the answer "sorry i didnt really understand what you were saying." but on the phone he said okay okay. Room service was really bad, this wasnt the only problem with it. Also most of the staff are not really friendly, except a few one at the lobby bar they are great. 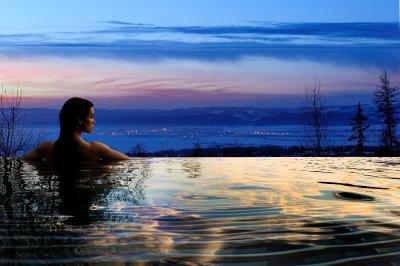 The wellnes area and outdoor pool is really small, the pictures are tricky, that "beautiful infinity pool can fit max 20 person at a time. I left the WORST part to the end, the kitchen. First, we wanted to try their 7 course tasting menu, i wrote an e-mail in advance to book it, i did not get a reply but they showed me the emailt so it was maybe the systems fault. Never mind. We arrived, we talked with the receptionst, she said, okay okay no problem you can book it here tomorrow, tomorrow we went to the reception again then they said, sorry the chef is not in the hotel?!?! you can only try on sunday (the day we left), never mind we eat al la carte. Oh my god, the soups were ok, not good just ok, but the all of our main course, i mean all, were COLD, not warm, COLD. Overall the hotel is nice in good condition, the enviroment is beautiful, but the staff makes NO-GO for us again. It's sad. First of all, me and my friends really wanted to check out this hotel for a long time, the building wich was built in 1904 is really beautiful, well renovated, we had 2 classical room and a modern suite, the rooms are nice, the bathroom is good size with a bath tub, had a nice view. 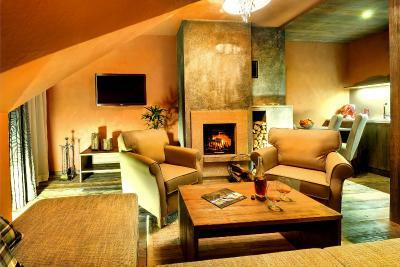 The suite is big, fireplace makes it very cozy. The bar is very nice, huge variety of drinks and cigars, the bartenders are really friendly and helpful. Diner le a bit expansive in hotel but lots of other options in town. Spa was a bit crowded. Nice room,,beautiful nature just outside the hotel. Close to ski slopes. Beautiful pool and spa.